This is the "Lite" version of our popular deck box, designed by UmmaGumma to take 37 sleeved Keyforge Cards. This box has thinner walls and is slightly smaller externally than our other deck box. It features cutouts to display the Archon's name and each house in the deck. Please note that this listing is for the deck box only - the cards are NOT included and are shown in the photos for display purposes only. The box has a clean design which gives great protection while still displaying your deck identity. 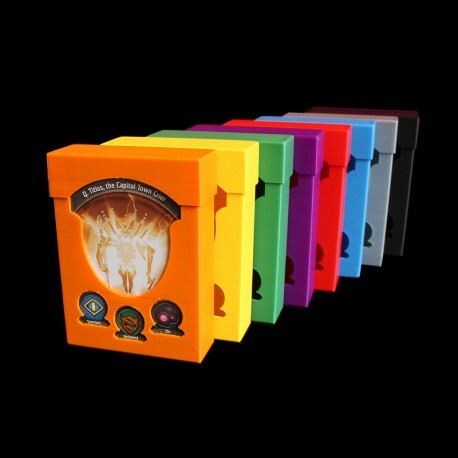 The box is available in a variety of colours. This item has been 3D printed at a high resolution to ensure a very good finish and precision fit of the lid to the box. However, as is to be expected with this process there may be some very slight surface marks. The photos in the listing have not been retouched and give an accurate representation of the kind of finish you can expect. There may be some small variation in colours between batches. Please note that the colour of the item in the photo above does not indicate the colour you are buying. Please click on the colour box above the Add to Cart button to select your required colour.